Home Bad debt credit card debt Debt Debt Free Get out of debt Good debt Good Debt or Bad Debt: Is There a Difference? 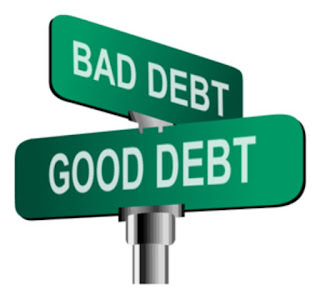 Good Debt or Bad Debt: Is There a Difference? While it is very much possible to live completely debt-free, it is always the best thing to do. As counterproductive as it might sound, there are some things that can actually be good debt for you. It is knowing the difference, though, and knowing how to manage your finances well, that will keep you in a good place and keep your credit score rating high. Intrigued to hear more? Then read on. In short, good debt is where you have an investment of money, and it is just that; an investment. So debt to buy a home, for example. Not only is that going to benefit you in that you have somewhere to live, but it also means that you are paying money off each month to own a home, rather than paying money to a landlord each month, not investing anything. So a mortgage is a good example of good debt. An article from bankrate.com might make for an interesting read if you want to know more about it. However, in order to qualify for a mortgage, then more often than not, you need to have a good credit rating. If you have never had anything like a credit card or a small personal loan, then they don’t have anything to compare it to. They don’t know that you pay money back once you have borrowed it if they are no examples of that in the system. So for some things, getting a credit card can be a good way to get a credit score. They are described as your flexible friend, after all. The key is to paying off your debt on your card in full each month. Not only does it look good to lenders and improve your credit score, but it means you don’t have to pay any interest. So when used wisely, a credit card could be an example of good debt. When you haven’t budgeted well or just use the card for things that you want, rather than things you can afford, it can spiral out of control. The interest rates might end up being quite high, and it could lead to you getting into more debt. This is when it is bad debt. The same as payday loans or short-term loans that have an extremely high-interest rate. They are best to be avoided if you want to keep out of debt and have a good credit rating. If you find that you are ever in a lot of debt, then a site like consolidated.credit might be able to give you some help. When you consolidate debt, it can mean paying less interest, which should be able to help you to clear your debt. Something to think about anyway. So next time you are looking at getting a loan or credit card for something, you need to think to yourself ‘do I really need this?’ and ‘is this an investment?’ When you can differentiate between the two, it will make a massive difference to your finances.